Admittedly, Steve Harvey gets the side eye from me often. But no matter what I think about his philosphies, I can’t deny how overwhelmingly joyous it must feel to finally see results from the hard work you’ve been putting in over a certain period of time, and to be able to share that with your significant other. Steve Harvey broke down at a recent comedy show and thanked everyone who helped to make him as successful as he is, but what stood out is that he gave a special thanks to his wife. His gratitute toward her isn’t just about the fact that she helped his career, she also made his quality of life better all around. That’s what marriage is about, improving the quality of each other’s lives just by being there. It sounds cliche but I don’t think people can hear that enough. Too many people endure toxic relationships and never get better because of it, so it’s sweet that Steve acknowladged how his wife’s pressence made him a happier man, which certainly contributed to his drive. If there’s one thing I am thankful for, it’s that despite the fact that my career situation is very stagnant right now, Mr. Rocque still makes my life better. 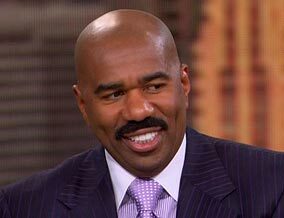 I don’t look to him for my happiness but his presence certainly helps, so for once, Steve Harvey, we’re on the same page.